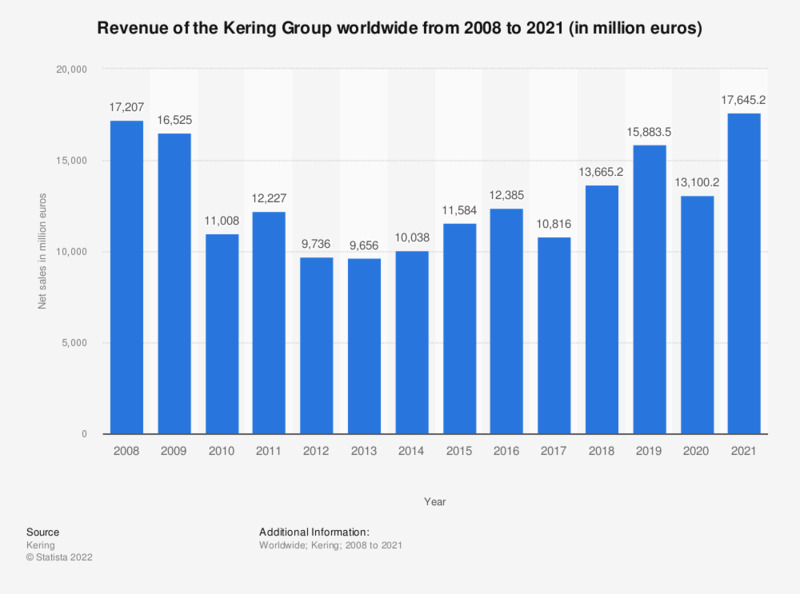 This timeline depicts the global revenue of the Kering Group from 2008 to 2018. In 2014, the Kering Group's global revenue amounted to about 10.04 billion euros. The Kering Group (formerly known as PPR S.A.) is a retailer of apparel and accessories that designs, manufactures and markets products across two segments: luxury, and sport and lifestyle. The company’s product portfolio includes leather goods, shoes, ready to wear products, jewelry, watches, sports equipment, clothing for athletics, action and outdoor sports. Some of its brands include Gucci, Bottega Veneta, Saint Laurent, Volcom and Puma. In 2014, the Puma brand generated 2.99 billion euros in global revenue. Puma accounted for 94 percent of the global revenue generated by Kering's sports and lifestyle division. The biggest brand of the Kering Group is Gucci. Over the years Gucci has been implementing a brand elevation strategy that will encapsulate the brand's quality, creativity, innovation and Italian craftmanship. By moving towards the mid-high end of the market the brand has been steadily increasing its appeal among the sophisticated and exclusive luxury consumers. In 2017, Gucci was ranked as the third most valuable luxury brand in the world; just behind Hermès and Louis Vuitton respectively. The Paris-based Kering Group has been busy establishing protocols for more socially and environmentally sustainable business practices in an attempt to put monetary value on its environmental impact with the aim being to protect and maintain the company's reputation. * Figure does not include Fnac and Redcats.